You read it again to make sure. Yep. “Thou shalt commit adultery.” Can this be right? You would ask your husband for a second opinion, but you don’t want him getting any ideas. Three centuries later, this particular version of the King James Bible is known by another name: The Wicked Bible (aka “The Sinners’ Bible” and “The Adulterous Bible”). 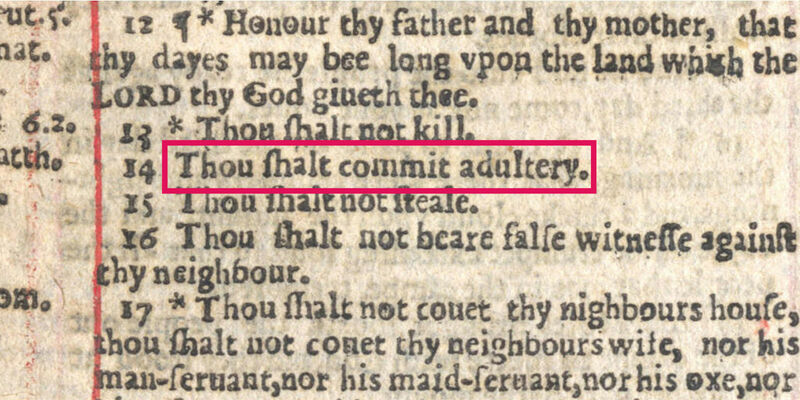 About 1,000 copies of the text were printed in 1631 with the word “not” missing from the seventh commandment, scandalously transforming an exhortation of faithfulness into a skeevy call to swingers. And while it may seem funny today, for royal printers Robert Barker and Martin Lucas it was anything but. Robert Barker is probably best known for printing the original edition of the King James Bible in 1611. This landmark of publishing wasn’t without its own errors; notably, one mixed-up pronoun in the book of Ruth referred to the title character as a “he” instead of a “she,” earning the first edition of the KJB the playful nickname, “The Great He Bible.” Barker corrected the pronoun in his next edition, but continued to let minor typos slip into the Good Book on and off for the next few decades (a good editor was hard to buy when most of the country was illiterate). Luckily, each mistake was deemed excusable… until The Wicked Bible. Nearly all 1,000 copies of the Wicked Bible were recalled or burnt, but some remain visible in private collections today (On rare occasions, you can catch a glimpse of the offending commandments at the New York Public Library or Dunham Bible Museum in Houston). Those that are unaccounted for could be extremely valuable: one copy sold at auction for $40,435 in 2015. These things happen. We bet you never noticed the typo on the Lincoln Memorial.